Zootropolis (or Zootopia in the US) is the newest film from the Disney production line, directed by the trio of Byron Howard, Rich Moore and Jared Bush. 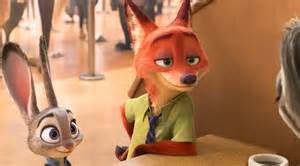 The simple plot surrounds Judy Hopps (Ginnifer Goodwin), a police officer in Zootopia working a case with rogue fox Nick Wilde (Jason Bateman), when it turns out to be more than just a standard missing person report. Yet the element that’s ‘exciting’ people the most is how the film supposedly deals with racism and teaches children to be good people and not judge them by who they are or what they look like. I guess there’s no better time than this to get into it, but I think the film fails completely. To put it plainly and obviously, racism is a complex topic. It holds countless intricacies that are ingrained and institutionalised in our societal structures that go far beyond what we see at face value. And the way that Zootropolis deals with racism is incredibly ham-fisted. It goes so far out of its way to distinguish arbitrary binaries that can only lead to ‘I don’t like you because you’re different to me’ and the issue is just so much more than that. The argument that it’s just a kids’ film, therefore it can somehow get away with simplifying an issue like racism both demeans it to a film where its message results in ‘its ok to be different’ (which is fine but not ‘revolutionary’ or racism), and denies the possibility of a race conversation succeeding in the film whatsoever. Race isn’t and shouldn’t be a topic we dumb down or trivialise. There are even points in the film where an air of mockery seems to pervade, as ‘cute’ is equated as a racial slur for rabbits, and the response to being called out on using said supposed racial slur was a sort of ‘who, ME? I would NEVER do that!’ which again tonally brings a sense of trivialisation leading to disdain. Another bi-product of the complexities brought with racism is the incredibly mixed metaphors the film finds itself in as the third act progresses. Without spoiling anything, the film really fails to grab on to a specific idea of what it wants to tell. Fake and nonsensical twists that are only explained through ‘x can be bad too!’ are all over the place, leads me to believe (and maybe I’m reading way too much into a Walt Disney production) that it portrays an #AllLivesMatter message profusely more than a respective and translated oppressed lives matter one. Also as an extension of me maybe reading into things too much is the choice to have the protagonist and ‘white knight’ of the story be a police officer, just seems again both insensitive and somewhat quietly sympathetic to the oppressive system. And for a film that preaches against stereotyping, it’s somewhat coincidental that seemingly the only ‘non-Zootopian’ (taking Zootopian as American) are Italian, and surprise surprise, they’re mobsters. From an aesthetic standpoint, Zootropolis is technically impressive, with its standout feature being the detail of the characters. From my own, subjective eyes however it’s really not that good looking. Bar the fact that I’m not 3D animation’s liveliest supporter, it doesn’t attempt to shift the mould that the post-Tangled shiny and polished Disney world has so aggressively stuck to. Potentially one of the harshest critiques of an animated style is to call it bland, and I honestly believe Zootropolis looks nothing more than that. I’m not saying the skill went into creating the film is remiss, because like I said before, there is really evidence of technical expertise here, but I start to question what the point of technical prowess is if the end result is completely uninteresting. To its credit, there were some points I genuinely chuckled, and despite being thoroughly frustrating, I did not get bored. I guess I wouldn’t personally describe the film as entertaining to an extent, but I can certainly see how someone else (especially a child) would enjoy it. Overall however, its tackling of such a complex aspect of society such as racism is really its ultimate downfall. It’s a catch 22 of compromising the topic for accessibility (or more cynically, money) but not doing the subject justice, or going all out and potentially alienating a large portion of your audience. Zootropolis (Zootopia). USA 2016. Directed by Byron Howard, Rich Moore & Jared Bush. Voices by Ginnifer Goodwyn, Jason Bateman, Idris Elba, J.K. Simmons, Octavia Spencer. Zootropolis is out in the UK today.